Is this what you see when you step on the scale in the morning? Picture courtesy of Carla Wardin. The Reaper courtesy of her boys. 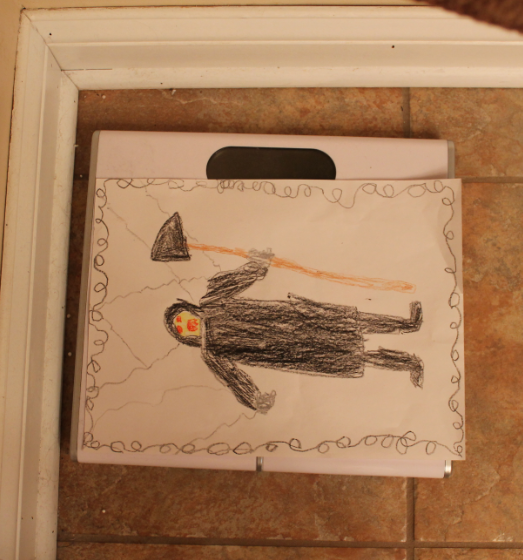 My nephew left this picture on the scale. The question is whether or not it was on purpose, but talk about a surprise when my sister-in-law, Carla, went to weigh herself that morning. In her words, "Nothing like the grim reaper to make you eat a healthy breakfast." Don't let the scale terrify or paralyze you. The scale is just a tool that is used to measure health and fitness. I recommend weighing yourself no more than every other week. Why? Because.... What are you going to do with that information every day? Start to monitor how you feel, what you ate, and how much you've exercised instead of the number on the scale. If you are monitoring what you eat and how active you are the number will never come as a surprise. The things left behind by other may still surprise you! What other tools do you use to 'weigh' where you are with your health? Why is it assumed that this type of "prank" is done by boys? Lol, because my boys love pranking their mother.